With its spectacular exhibitions and about 3 million specimens, the Museo Civico di Zoologia (The Zoological Museum of Rome’s Municipality) is one of the main reference centres for educational learning and for the preservation of the biodiversity. 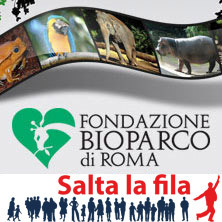 It is located in the centre of Rome, in the heart of Villa Borghese Park and, through interactive and multimedia exhibitions, it narrates the central themes of the animal kingdom, from the strategies used for reproduction that guarantee the survival of species, to the extraordinary adaptation to the most extreme environments – such as the deserts, caverns, or polar ice – from the complexity of the life in the coral reef, to the secrets of the local territory in the room dedicated to the wetlands of Lazio Region. The itinerary is completed by some important historical collections exhibited to the public. Very rich is also the schedule of activities and events for all ages.